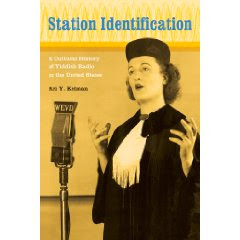 Station Identification: A Cultural History of Yiddish Radio in the United States. Berkeley: University of California Press, May 2009. Cloth: ISBN 978-0-520-25573-9, $39.95. 304 pages. An important contribution to the study of radio and Jewish-American culture, Ari Kelman’s publication is the first detailed study of Yiddish Radio history in the United States. Kelman’s attention to the impact of media regulations on immigrant radio, and to the use of language as a powerful tool for cultural identification, is valuable. In particular, Kelman demonstrates how American Jews shared a common desire to connect with other Jews. Radio became their virtual community, using the Yiddish language as a boundary to separate insiders from outsiders.Station Identification: A Cultural History of Yiddish Radio in the United States not only traces the rise of Yiddish radio, but also follows patterns of Jewish immigration, stratification of power among radio stations, twentieth-century American nationalism’s effect on the use of Yiddish in the United States, and the transformation of media outlets during times of war. The book is organized chronologically spanning the period from 1920 to 1980, and each chapter concentrates on a particular theme. The first theme is Jewish culture in the margin of the larger American culture. Religious traditions made Jewish radio different from mainstream American radio from the onset. Jewish customs and holidays impacted the days and times Yiddish radio could be broadcast, and what advertisements were appropriate for Jewish audiences. English language programming remained important to these stations, and broadcasters were constantly challenged by the English-Yiddish balancing act. The radio created a space for Jewish immigrants to maintain their religious cultural identity, while assimilating into English-American culture. The second theme is the relationship between American nationalism and radio regulation. Although Yiddish radio communicated to a relatively small portion of the American population, immigration restrictions in the 1920s led to a push for English homogenization, causing Yiddish radio to appear as a threat to the national agenda. Broadcasters reacted to these threats by creating shows that encouraged assimilation. This prepares the book’s third theme: Jewish-American representation. Who were the Yiddish radio personalities? How did they describe themselves, what techniques did they use to connect with listeners, and how did their audiences respond? How did these radio personalities represent a Jewish-American identity? Yiddish radio listeners desired to hear people on the radio whom they could relate to, and who exhibited qualities they found in themselves. Kelman argues that Yiddish radio provided a framework from which American Jews could reflect upon and make choices about their identities. Perhaps the most engaging theme in the book is the effect of World War II on Yiddish radio and the Jewish-American population. The Yiddish language allowed Jewish radio broadcasters to comment on World War II with more freedom than their English radio counterparts. Yiddish was especially symbolic during this time, aurally connecting American Jews to European Jews. These radio stations vigorously encouraged the purchase of war-bonds, which were equally symbolic as expressions of American patriotism with the intention of supporting European Jews. Radio personalities transformed listeners from passive audiences into activists who supported American efforts for Jewish causes. Station Identification is a well-written product of intense archival research, and a significant addition to the history of Yiddish culture; however, for the ethnomusicologist and indeed for the general reader, something is lacking. The reader only experiences this history through Kelman’s voice. There are no transcriptions, and quotes from broadcasters or audiences are few, making the voices of Yiddish radio seem suppressed. For a book concerned with the verbal communication of a specific community, and their important linguistic codes, the absence of these texts is troubling. To the author’s credit, he does include the web addresses of the American Jewish Congress and the Yiddish Radio Project in the bibliography. Yiddish radio sound files from these sites truly complement Kelman’s book. In the endnotes, the author does reference recordings of radio shows, and directs the reader to audio streaming sites when available. But as the book stands, the reader must have an outward interest in searching for these sources in order to experience Yiddish radio in sound or text. Regardless of these criticisms, the book is an important contribution to Yiddish studies. The main themes will easily translate to pop-culture studies involving other immigrant communities, and ought to interest readers from a variety of disciplines.